Yogis are made, not born. Even the word ‘yogi’ will make some grimace, but many are still curious about the positive effects of yoga as its’ benefits for health, behaviour and happiness. Since emerging from my isolated online practice to engage in the ‘community’ of yoga, I’ve started to realise how the popular image – instagram shots of impossible backbends or the stereotype of the chilled out hippy floating through life without a care or real responsibility – can put off those who would benefit from a yoga practice most. Those people are the ones who need a bit more time spent focusing on their mental and physical health, a break from the rat race, space from seemingly relentless responsibilities, or some time to recalibrate from chaos (whatever its’ cause may be). Even those who have no access to social media often tell me that they just can’t do yoga. They may have tried it and given up in the past, not be naturally flexible or worry about how they will look in a class next to more experienced students. I felt all of these hesitations along the way – but can now see ways around these genuine but limiting fears. Whilst Real Pro Yoga is only just beginning, it’s the culmination of many false starts. I hope that the following timeline of my fitful relationship with yoga can give some inspiration to those who want to start but are struggling. It’s very much in note format as the writing became almost autobiographical! I’ve summarised in life stages and taken ‘Year 1’ as when I first experienced serious back pain. I’ll pick up on specific themes in more detail in future posts. If there’s anything in particular you’d like me to expand on, please use the contact form for suggestions. Teenage years – Ad hoc classes – I loved the final relaxation (savasana) as a stressed out teenager, but classes were too expensive to do regularly. I didn’t go often enough to see any yoga (asana) improvement, was anxious about how I looked (body & balance) and more interested in losing weight than improving my overall health. Therefore, I saw limited value in this slow stretching & bending. University – First neck pain/RSI. First diagnosed IBS. Changed diet to accommodate. Took up pilates & went to the gym. Working life (20s) – Lots of travel, lack of control over my location and working hours (and grad scheme partying, let’s not lie!) led to periods of stress and insomnia. I exercised when possible but never considered a yoga class as there wasn’t one nearby, I couldn’t commit to 6-week blocks in the same place on the same day and I was strapped for cash paying London rent. Choir (from 2010) really helped to give me balance during this time. Thirties (Winter Year 1) – Back pain began close to my 29th birthday, after I incurred an injury moving house. A diagnosis was slow and unclear, treated with codeine, heat pads and minimal physio. I changed my diet again, cutting out gluten to alleviate IBS (pain brought on by the codeine). The pain receded after a sunny holiday four months later and didn’t return. Feeling better, I took up in-workplace yoga. It was easy to get to, affordable, and the teacher was understanding and calm. I loved the dynamism of Vinyasa Flow as opposed to the static postures of Ashtanga. Easter Year 2 – Ran my first (and only!) half marathon, fully recovered from back pain. Moved jobs, but there wasn’t an obvious, convenient or affordable local yoga class in my new office or near home. I missed it, but was doing well physically. Winter Year 2 – Back pain returned. The physio told me that yoga wouldn’t help and to focus on other forms of exercise. Needing to focus on whatever would relieve the pain, I stopped practicing yoga. Easter Year 3 – My back pain was still ongoing, making life very difficult. The regular codeine exacerbated my IBS and left it difficult for me to do much without either back or digestive pain. A CT scan of my head and spine showed no problems whatsoever. Eventually the physio told me that stress could be the cause (rather than an effect) of my back pain. Supported by a great occupational health programme at work, I started to study pain and exercise regularly to build up strength, flexibility and cardio fitness to improve. My back pain abated in the Summer. Winter Year 3 – YWA – Yoga Revolution 31 day yoga course completed. I avoided any return of the back pain in the Winter months, and felt in control of my body for the first time in years. Easter Year 4 – Real Flow Yoga (RFY) Yoga Teacher Training (YTT) signup. I’d been thinking about wanting to take my yoga to the next stage and this year my job and personal situation conspired to make it feel like a ‘now or never’ moment. So I signed up. 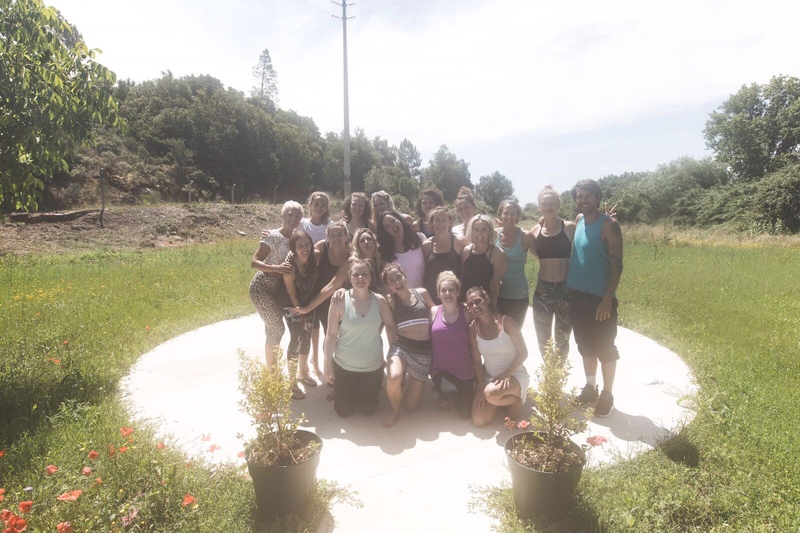 Summer Year 4 – Start yoga teacher training (3 month course). I turned up having done very little yoga for months whilst I was moving house, organising a wedding and generally getting on with a busy life. Although I never intended to teach at the outset, here I am. Taking the plunge and doing the course was a great decision, and my experience there will form a whole future blog post. That take us to now. September 2018, 19 years since my first flirtation with yoga, but only 3 since I began any kind of regular practice and 3 months since I became ‘serious.’ I’m nervous of showing before & after photos here as it then seems like promising a physical transformation, but if anyone catches me in person (and is interested, there’s nothing worse than people forcing their ‘journey’ on you!) then I’ll be happy to show you how much just these 3 months have helped my posture, strength and shape. Now it’s time to take all of that accumulated knowledge into the real world. That is what the ‘Real’ in Real Pro Yoga is all about – I am to support yoga for real people. The ‘Pro’ is either for Professionals as clients or referring to the fact that anyone can be a ‘real pro’ at yoga if they want to be. I hope that this can be in some way encouraging to those starting out, and that it takes away the illusion that committing to yoga is an unachievable feat. Please remember that everyone’s body is different and that my experience of chronic pain is by no means universal – don’t go jumping into yoga if you’ve been experiencing pain unless your doctor/physio approves (but don’t be shy about getting a second opinion if you feel you need it).